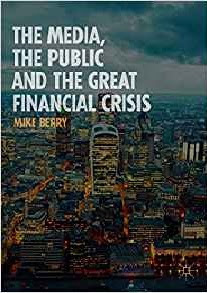 If you take note of the growing evidence that the partisan media can influence public opinion rather than simply reflect it, then this new book by Mike Berry (full title ‘The Media, The Public and the Great Financial Crisis’) is a must read. At its heart is content analysis (what the media said) and audience studies of two key periods: the Global Financial Crisis (GFC) and Austerity. There is a wealth of fascinating material here, which I couldn’t possibly summarise with any adequacy in a single post. Instead I want to focus on the two final chapters. The first helps explains why large sections of the public were so receptive to the 'Labour profligacy caused the crisis' myth. The second involves discussions with journalists. I have written in the past (and also in my own book) about why the suggestion that Labour profligacy caused the deficit is simply untrue. The deficit was unremarkable in 2007, and exploded because of the GFC. I have focused on how this untruth was repeated endlessly by Coalition politicians and the right wing press, and how it was not challenged by the broadcast media or the Labour party. What Chapter 6 of Mike’s book shows is why this idea of Labour profligacy caught on so easily. Between the early 2000s and 2010 the right wing press (in Mike’s sample the Telegraph, Mail and Sun) began to publish more and more stories about public sector waste. Now defenders of the press might argue that there was more waste because of a Labour government, but the number of stories in these papers increased over the period by 600%. A much more plausible explanation was that these papers were trying to undermine what the Labour government was doing, particularly as it was popular. In this way readers of these papers were primed for the idea that Labour was being profligate. As a result, something that was clearly false could be sold as true. The idea that the media is ‘only reflecting the views of their readers’ is so obviously false in this case, because any journalist worth their salt could look up deficit figures, see that the recession caused the deficit to rise, and inform their readers. In reality these papers promoted the lies, and the non-partisan media did not bother to correct them. So why did the broadcast media start obsessing with the need to reduce the deficit? What is clear from Mike’s interviews with Robert Peston and Evan Davis is that the broadcasters really believed a large deficit was a problem of the utmost importance that needed to be tackled. The book contains extracts from his interview with Evan which I abbreviate here. A journalist might say gotcha. So it wasn't the imagination of a 'rigid' Keynesian: the BBC really did promote austerity. You can see why I also treat BBC claims that they told everyone that more than 90% of economists thought Brexit would be harmful with a large pinch of salt. If you want to understand political developments since the GFC you have to understand the media, and that means collecting and analysing hard data in the way that Mike and others media studies academics do. What Mike does so successfully in this book is show how stories in the press were reflected in people’s attitudes and how this can have a profound influence on the political climate and therefore what politicians do. What's your proposal to tackle this issue? Is it more govt. control over the media? As I see it one of the major problems you have is comprehension with reard to such issues as austerity. The elision of the household analogy into the macroeconomic position is something that most can comprehend so the argument for austerity is so much easier than the Keynesian version which is counter intuitive to the lay person. By saying that many of the issues you discuss are relatively complicated for most people is not a patronising remark but a simple statement of fact. I think the question is not about Keynesianism but about how a BBC journalist could possibly think they were not about to be part of a canyon of lost GDP growth which would leave the generations coming up beneath them asking what role you played in this farrago? Asking what is the relationship between the BBC culture and a strong and rigid position when it comes to Austrian economics. If you want to understand the BBC as a whole I'd thoroughly recommend 'The BBC: Myth of a Public Service' by Tom Mills (of Aston University IIRC). In an excellent chapter there you'll read how Evan Davis himself plays a key role in the 70s to 90s morphing of BBC's economics coverage from broadly labour-relations/industrial to financial/capital. It's role during this time was much more a facilitator of change in emphasis as it was a follower of political concerns. Bear this in mind when you read his excuses in Berry's book. Advertizing works, that's why big companies do it. Very few people study deeply. My big gripe against Labour in 2010 is too much time was wasted on the leadership election of Ed Miliband, and none on batting away this stupid 'Labour left a mess', when under Darling the economy was recovering and Osborne wrecked it. When a newspaper decides to create the impression of "Labour profligacy", how does it work? Do a lot of clever men and women sit around a table and coolly discuss the best way to deceive the public? Is it as blatant as that? "We are going to need a few years of 'public sector waste' stories". And who co-ordinates the campaign? It seems hard to believe that each newspaper independently decides to put teams of journalists to produce these stories. Does the Conservative Party send out the same dossier---full of stories---to each of the UK's many Conservative newspapers? Or do the newspaper editors all get together to co-ordinate the campaign? 2. if recapitalising the banks after they'd overelveraged themselves was a major driver of the deficit, wouldn't Gordon Brown be responsible for that having encouraged banking deregulation? With regard to Brexit I think people overestimate the influence of the media but underestimate the influence of the European Song Contest. People expect the media to be biased and they adjust accordingly. They see the shenanigans of the Song Contest vote as an unvarnished representation of how Europe and hence the EU works. The Iberian counties vote for each other, the Scandinavian countries vote for each other, the Eastern European countries vote for each other irrespective of merit. There was a classic incident in the voting a few years back. In the first round, the votes of each country’s ‘expert panel’ were reported. In the second round, telephone votes from each country were reported. At the end of the first round, the Polish song was bottom, but surprisingly the UK telephone vote awarded the song maximum points. It seems clear that the Polish Community decided to hijack the UK vote. They decided to disregard the principle that you can’t vote for your own country and decided instead to disrespect their host country and its sense of fair play. After, this and other incidents the Eurovision organisers decided to implement a new and ‘improved’ way of reporting the votes which ensured that this effect was no longer visible. No doubt it still occurs but we are no longer allowed to know about it. This tells us everything we need to know about how European organisations operate. In the early days, of the contest the UK sometimes did well and sometimes badly depending upon the quality of the song, now they always do badly irrespective. This is despite the fact that the UK music industry is one of the most successful in the world. The UK public sees discrimination against the UK in the song contest. They see Cameron lose an EU vote 2-26. They put two and two together and they get four. On the Subject of media bias, there are articles in the Telegraph and Express today on the fact that European investment in the UK has more than doubled since the referendum but there is no mention of this in the Remain broadsheets. The fact that the Norwegian wealth fund plans to increase UK investment was reported in the Mail, Yahoo and even Briebart. This news did make it to the FT and the Times but the Guardian decide to save their readers sensitivities, it wouldn’t do to challenge their belief that the UK is an economic basket case post referendum.